Central Jakarta Social Sub-dept. is distributing logistic aid towards 63 victims of collapsed wall at Jalan Kembang V, RT 03/02, Kwitang Urban Village, Senen today, Monday (4/2).
" 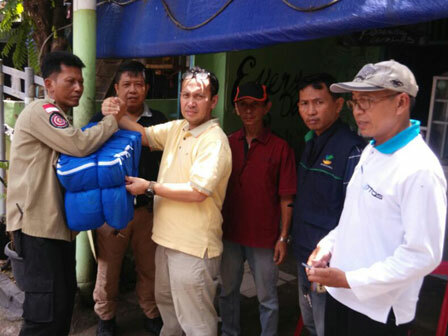 We distribute the aid this morning to the victims through our refugee camps on site"
"We distribute the aid this morning to the victims through our refugee camps on site," expressed Susana Budi Susilowati, Head of Central Jakarta Social Sub-dept., Monday (4/2). According to him, the aid given is in form of 20 boxes of instant noddle, 48 cans of fast-food side dishes, 2 boxes of vegetable oil, 20 blankets, 15 tarpaulins, 12 mats and 50 kilograms of rice for 18 households or 63 people. "We'll distribute another aid if there is request from the local apparatuses," he stated. As for the information, a wall-collapsed incident was occurred at Jalan Kembangan V, RT 03/02, Kwitang Urban Village, Senen, Central Jakarta yesterday, at around 11 PM. No casualties reported in the incident, yet nine homes were damaged.